I had said in an earlier post that I had been in a felting frenzy. I made a few felted Christmas ornaments. Here are some of the beads and jewelry I’ve been working on. 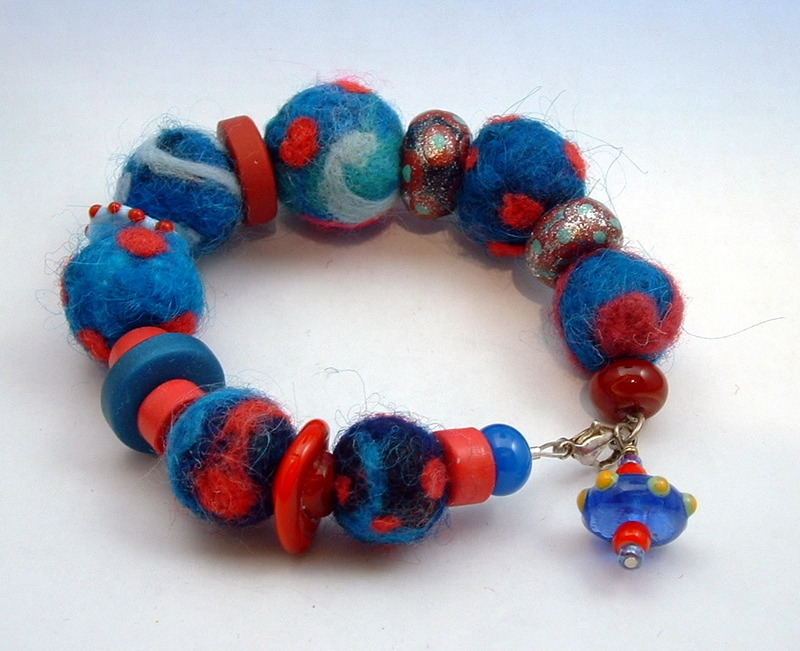 This bracelet incorporates my polymer clay and lamp work with the felted beads. 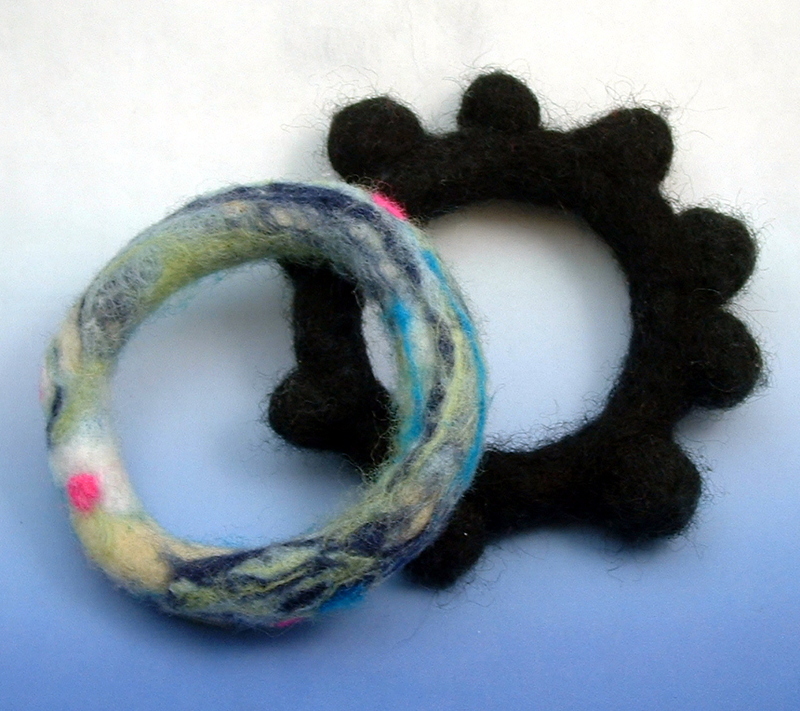 The bangle on the left is needle felted and for the one on the right, I sewed needle felted beads onto a ready-made felt bangle. Earrings. 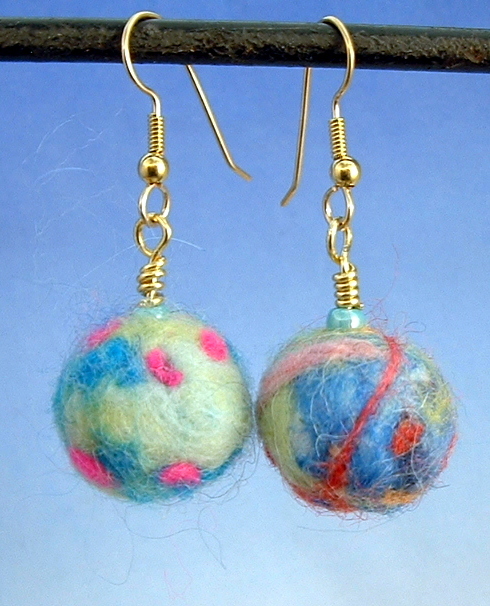 Felted earrings are so light! I prefer needle felting to wet felting although for the bracelets, after I needle felt the wool onto the core rope, I like to give it a bath in hot soapy water and work it so it’s more durable. 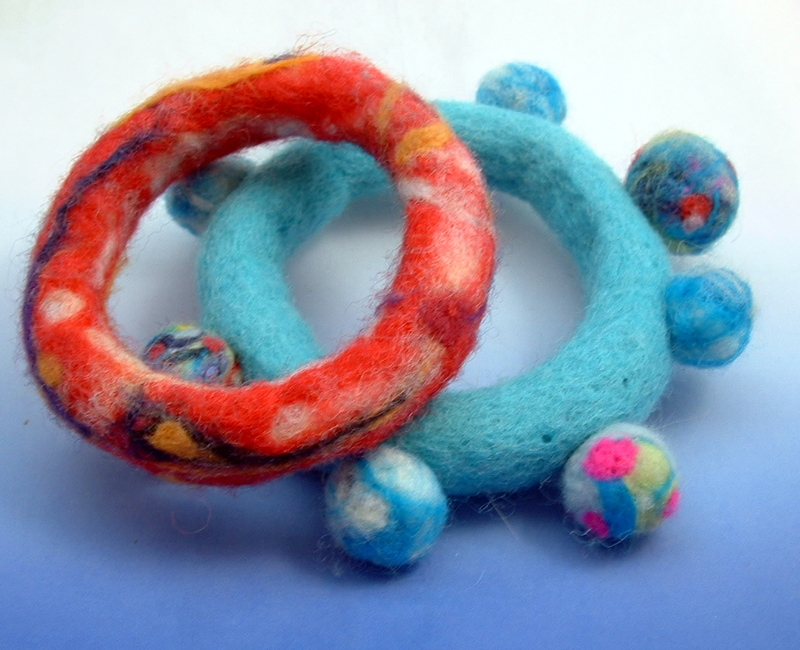 I am experimenting with needle felting bracelet and bead cores from polyester fiberfill (cheaper) and using the more expensive colored roving over them. I have also needle felted undyed (cheaper) roving over the fiberfill and then have dyed the beads (you can use food coloring and vinegar) before drying and embellishing. I have just started cutting tiny simple designs out of craft felt and needle felting it on to the solid bead. For one thing, you can make lots of felt dots with a paper hole punch and needle felt the dots onto the bead. There are plenty of felting supply retailers in the Internet. Don’t forget Etsy and eBay. 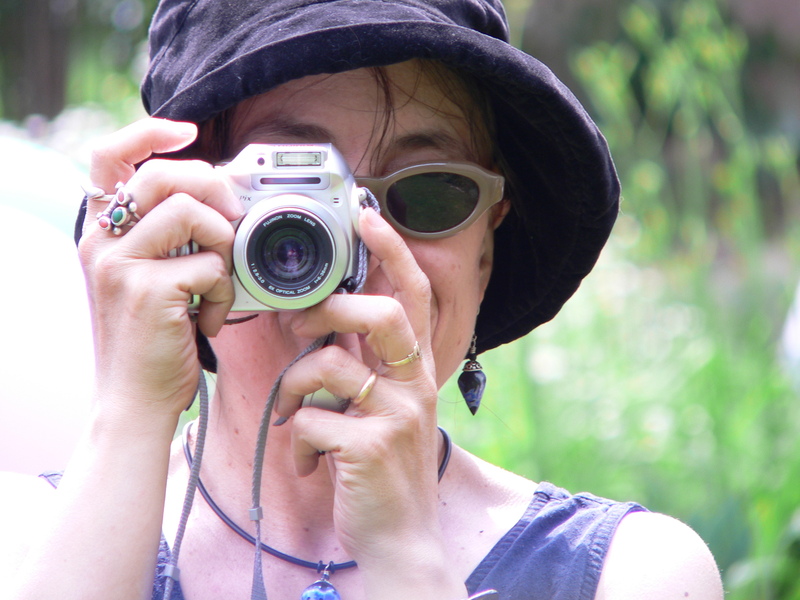 Check out the Red Barn Farm storefront while you’re on eBay. If you’re interested in trying felting, they have some supplies that won’t break the bank. Here is a good beginners video from YouTube. 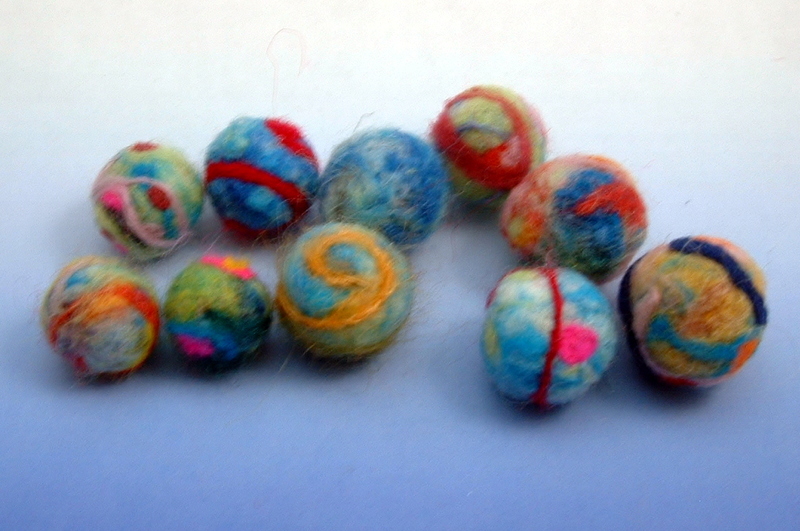 1 reply to Felted Jewelry and Beads.